Modal Groups  Make HTML content visible in response to a user event. Popup Windows  Pop up a new window that displays a Zen page or any other content. 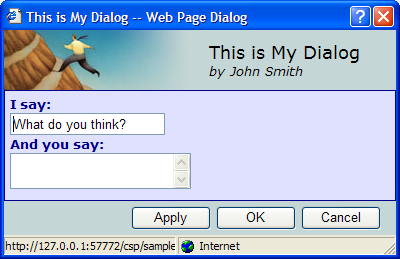 Dialogs  Pop up a dialog that prompts the user and accepts user input. A modal group is a specialized group component that normally does not display its contents. When the modal group is made visible, only its contents receive user events. Any event that occurs outside of the modal group (such as a mouse click) automatically hides the modal group. Zen uses this modal mechanism when it creates drop-down menus and drop-down combobox controls. You can also use this mechanism for popup items. Static  Place a <modalGroup> component in the page class XData Contents block. Its contents remain hidden until a client-side method on the page calls the modalGroup show method. Dynamic  Have the page call its createComponent method to create a modalGroup component dynamically. Add components to the group. Display it by calling the modalGroup show method. Built-in  Have the page call the modalGroup show method to display one of the built-in modal groups: "msgBox" or "calendar"
To close the current modal group, the page must invoke its endModal method. Generally endModal is triggered by an event handler for one of the buttons in the modal group (OK, Cancel, or similar). It is an error to call endModal if there is no modal group currently displayed. While a modal group has the editing focus, keyboard controls are disabled. For example, it is not possible to use Tab to move from field to field within the modal group. This prevents the user from (inadvertently) pressing Tab to navigate through all the fields and then back to the page, while the modal group has focus. The modal group keeps the focus until the user either clicks away from it or clicks the button that has been set up to close the modal group. For Internet Explorer (IE) only: When displaying a modal group, Zen hides the contents of any <embed> elements (that is, SVG content). This is because IE ignores zindex setting for <embed> elements. onStartModalHandler(zindex)  If present, fires upon notification that this component is about to become modal. That is, it is pushed to the front of the display. The caller supplies a zindex value large enough to ensure that this component is placed above all others currently visible in the browser. onEndModalHandler(zindex)  If present, fires upon notification that this component is about to stop being modal. That is, it is no longer be pushed to the front of the display. The caller supplies a zindex value small enough to ensure that this component returns to its normal layer relative to other components in the browser. In static mode, the modal group is defined within a page class XData Contents block using XML statements. The contents of the group are hidden until the modal group component’s show method is called; then they are displayed in a popup window. Calls the client-side show method. No arguments are needed because the <modalGroup> definition provides all the necessary information to show. <button caption="Enter a New Value"
The page XData Contents block now looks like this. Executes when the user clicks OK in the popup. This works because step 1 identified this method as the onclick event handler for the <button> in the <modalGroup>. Calls the page’s endModal method to close the popup. Clicking the button on this page invokes the modalGroupStatic method. This causes a window to pop up in front of the main page. The contents of the popup are the contents of the <modalGroup>. The popup title is the <modalGroup> groupTitle text. The above example is similar to one available in the class ZENDemo.MethodTest in the SAMPLES namespace. You can try this sample from the Zen Demo main page by choosing Home, Overview, Methods, then Modal Group: Static. To get started, see The Zen Demo as described in the Introducing Zen chapter of Using Zen. // Show the group in "dynamic" mode. For argument details, see The show Method in this chapter. Executes when the user clicks Save in the popup. This works because step 1 identified this method as the onclick event handler for the Save button in the modal group. Calls the page’s endModal() method to close the popup. Clicking the button on this page invokes the modalGroupDynamic method. This causes a window to pop up in front of the main page. The contents of the popup are the child components that modalGroupDynamic added. The popup title is the first argument that modalGroupDynamic passed to the show method. Provide a client-side method to display the modal group. Calls the modal group’s setProperty method that sets its onaction value to the name of a client-side method. setProperty executes when the user performs any action on this popup, such as selecting a date value from the calendar. It accepts an argument, group, that represents the modalGroup instance. Executes when the user clicks on a specific date value in the popup. This works because step 1 identified this method as the onaction event handler for the modal group. Calls the modal group’s getValue method to retrieve the date value entered into the calendar. Does not call the page’s endModal method. The built-in calendar modal group closes automatically when the user chooses a date. Clicking the button on this page invokes the modalGroupCalendar method. This causes a window to pop up in front of the main page. The popup title is the first argument that modalGroupCalendar passed to the show method. 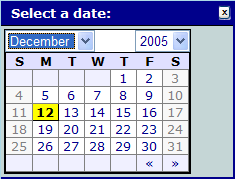 The currently selected date is the one specified by the third show argument. The above example is similar to one available in the class ZENDemo.MethodTest in the SAMPLES namespace. You can try this sample from the Zen Demo main page by choosing Home, Overview, Methods, and Modal Group: Calendar. To get started, see The Zen Demo as described in the Introducing Zen chapter of Using Zen. Clicking OK on the popup dismisses it. The above example is similar to one available in the class ZENDemo.MethodTest in the SAMPLES namespace. You can try this sample from the Zen Demo main page Home, Overview, Methods, and Modal Group: MsgBox. To get started, see The Zen Demo as described in the Introducing Zen chapter of Using Zen. title  Title for the popup window. For static modal groups, this overrides the groupTitle value in the <modalGroup> definition. "calendar"  Display the built-in calendar box. "dynamic"  Display a dynamically created modal group. "msgBox"  Display the built-in message box. "static"  Display a statically defined <modalGroup>. If no type argument is supplied, the default is "static" if a <modalGroup> definition exists within the <page>. Otherwise the default is "dynamic". "calendar"  value is a date in YYYY-MM-DD format. When the window pops up, the calendar displays this month and year with value as a pre-selected date. "msgBox"  value is the HTML-formatted message content for the popup message. parms  Object containing a set of additional characteristics passed on to the modalGroup as a set of name-value pairs. Typically this offers a way to pass additional parameters to the popup calendar. The <modalGroup> component is the XML projection of the %ZEN.Component.modalGroup class. The following table lists the <modalGroup> attributes that are available when defining a <modalGroup> within a page class XData Contents definition. Zen group attributes <modalGroup> has the same style and layout attributes as any Zen group. For descriptions, see Group Layout and Style Attributes in the Zen Layout chapter of Using Zen. Title to display at the top of the modal group. For static modal groups, you can set the groupTitle value in the <modalGroup> definition. Otherwise, this value is set dynamically by the first argument of the show method. Caption displayed in OK button for a message box. The default is "OK". If you provide a seed value for the <modalGroup>, it is automatically passed to the onaction event handler. seed Allows you to pass some arbitrary value to the onaction event handler. value (Read-only) value is set by the show method; applications should not set this. However, it is sometimes useful to retrieve this value, for example when working with the built-in calendar modal group. By default, Zen renders popup windows as <div> elements drawn on the current Zen page. If you want popup dialogs to display in separate windows, you can set the global ^%ISC.ZEN.useSoftModals to 0 or override the method %OnUseSoftModals so that it returns 0.
launchPopupWindow(...) Launch a popup window. Either identify the parent component, or allow it to default to the current Zen page. firePopupAction(...) Notify the parent component for the current popup that a user action has occurred. Optionally close the popup as well. onPopupAction(...) The parent component invokes this method each time it is notified that a user action has occurred on the popup. cancelPopup() Close the current popup with no further action. Add a client-side method to the parent page and make this method call launchPopupWindow. For more detailed descriptions, see the list of arguments following these instructions. action  If an action parameter is not specified, the literal string ok is the action code. value  Your code must provide a value; this value is automatically passed as an argument to the parent’s onPopupAction method. close  close is true by default. If true, the popup window closes after notifying the parent window. // tell our parent window that OK was pressed; do not close this window. popupName is the name of the popup window sending the action. action is the name of the action. value is the value associated with the action. All of these arguments are automatically passed to onPopupAction from the popup page’s firePopupAction method. When Internet Explorer is the browser, do not use a submit operation to save values from any popup window. Simply save the values. If you created a button or link on the parent page, such as the one shown in step 4 above, clicking that button now displays your popup page in a separate window, overlaying the parent page. pageName  A string that identifies the popup window. The results of these attributes are browser-dependent. Some developers prefer the Internet Explorer behavior, which is truly modal: the modal window stays on top and nothing can happen in the application until the user dismisses the modal window. Other developers prefer the non-modal behavior, which other browsers use regardless of how you set up this call: the modal window is just another window in the application and other windows can take priority over the modal window if the user clicks on them. parms  If provided, parms is an array of values to be used as parameters in the URI string that invokes the popup window. You can use the parms argument to supply parameters for the URI so that you do not have to worry about correctly formatting and concatenating URI parameters in the url argument. Given the above sample code, launchPopupWindow uses Aaa and Bbb as URI parameters, and gives these parameters the values that you assigned to the corresponding members of the parms array (10 and 20). launchPopupWindow takes care of all the details of correctly escaping these parameter values and combining them with the url value in the URI string. parent  If provided, parent identifies the Zen component to be notified when the firePopupAction method fires. This can be any component on the page, or the page object itself. If no parent value is supplied, the parent defaults to the page. If provided, the parent value is the system-assigned index number used internally to identify this component. For components within repeating groups, parent includes a dot followed by a number indicating the (1based) position of this component within the group. Applications can use but should not set the parent value. Zen includes some built-in classes designed to work as popup dialog windows. A Zen dialog window can contain any of the usual Zen components. All dialog windows are subclasses of %ZEN.Dialog.standardDialog, which is a Zen page class. This base class provides classic dialog buttons such as OK, Apply, and Cancel, as well as conventions for retrieving the values entered into the dialog if the user clicks OK. The %ZEN.Dialog.fileSelect window displays and lets the user choose from a list of directories and files on the server system. The resulting value is a full path and filename. To use the fileSelect dialog to view the file system on the server, the current user must hold USE privileges on one of the following resources: %Admin_Manage, %Admin_Operate, %Admin_Security, or %Development. Pathname for the file search window. This is either a full pathname or a path relative to the Caché system management directory (\mgr under the Caché installation directory). If omitted, the default is the Caché system management directory. A showdirectoryonly value of 0 so that files are visible in the display. You can omit this, as 0 is the default. Set showdirectoryonly to 1 if you want to show directories only. For a more complete example using %ZEN.Dialog.fileSelect, see ZENTest.FormTest2 in the SAMPLES namespace. For further details about the launchPopupWindow method, see the Popup Windows section, earlier in this chapter. For further details about the launchPopupWindow method, see the Popup Windows section, earlier in this chapter. query  the SQL statement used to populate the search form. This value cannot be passed in as a ZENURL parameter. Instead, applications should subclass %ZEN.Dialog.searchDialog and provide the query value using server-side logic in the subclass. paramNames  provides a comma-separated list of names to display for parameters in the search form. In your subclass, apply the style differences you require.